“Usually people do not write their own history. Some people are given a history that is not really theirs. But who can oppose and prove otherwise?” Andrea Stutliens situates this quote prominently on the title page of The Kaddu Wasswa Archive, A Visual Biography. For over fifty years Kaddu Wasswa worked as an activist, community organizer, social worker and teacher in Uganda. Through copy stand documentation of personal and professional mementos including scrapbooks, newspaper clippings, vernacular photographs and correspondence, The Kaddu Wasswa Archive gives an account of Wasswa’s life story, and may also be seen as providing insight into various social, economic and political issues in Uganda from the 1950’s to the present day. However, by foregrounding her engagement with Wasswa and her interpretation of his collection Stultiens problematizes a reading of this publication as a straightforward representation of Wasswa’s biography or Ugandan society. For example the introduction, which is written by Wasswa’s grandson Arthur C. Kisitu, is shown with handwritten amendments, and the items from Wasswa’s collection are depicted with Stultiens’ hands arranging objects for the camera. The effect of which could be interpreted as a visual metaphor for the subjective and protean nature of archives. Individuals who work to bring about grassroots change can often be overlooked in the broad sweep of mainstream histories. Yet arguably their stories may characterize the identity and culture of a society more clearly than narratives promoted by agencies of the state and commerce concerned with the production of heritage. 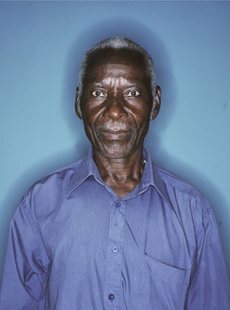 The Kaddu Wasswa Archive, A Visual Biography is best seen not only as a record of a man’s work in his local community but as a provocation to the status of personal archives and the inclusivity of history.